It's a much repeated line, but Medion's latest offering is excellent value for money. The P2010D (MD 8806) all-in-one PC offers good speed and storage, its screen has a Full HD resolution, and there is built-in Wi-Fi and a handy amount of USB ports. It's not perfect, but for $699 it doesn't need to be. It goes on sale at Aldi supermarkets on 26 January. Medion is out of the gate quickly in 2013 with an all-in-one PC that looks a little flashier than what we've come to expect from the German brand. 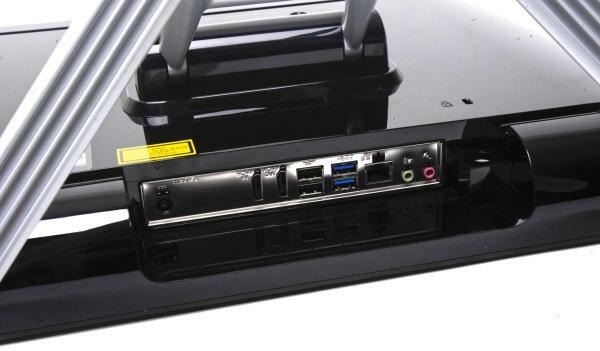 The P2010 D (MD 8806) is a 23in all-in-one that runs Windows 8, but it's not a touchscreen PC. It's just a regular PC and s a relatively space-efficient one at that. It makes use of Intel Core i3 processing technology, which can supply good performance for Web tasks, office work, media playback and more. Physically, the MD 8806 is just a little bigger than a typical 23in monitor, thanks mainly to the inclusion of speakers and a wide bezel. It's also thicker because it needs to house all of the computer's components, and this also makes it rather heavy (over 10kg), so you won't want to be moving it around too much. Its stand is metal with rubber stops under it, and it's in contrast to the glossy screen it holds. The stand's forked legs keep the PC sturdy, but because the PC uses a standard VESA mount, an after-market stand can also be used. You can't swivel the PC, but you can tilt it, which might help in trying to reduce some of the reflections that the screen is prone to giving. Connections are present on the left side of the unit, as well as under the rear lip. The latter connections are very hard to access if you don't tip the unit over and they should be used for any items that you want to 'set and forget', such as a Gigabit Ethernet connection, desktop-based external storage, printers and speakers. It's also the place where you can find the unit's two HDMI ports, one of which allows a second output screen to be added to the PC, so that you can use a dual-screen setup, while the other allows an HDMI input device to be plugged in so that the PC's screen can be used as a monitor. This can be a set-top box, a Blu-ray player or a gaming console. The screen has a Full HD (1920x1080) resolution, and it turned out to be decent during our tests. We didn't have any issues with its viewing angles, and colours were adequately rich for the most part. However, the screen struggled to display small text (eight-point text and smaller), often rendering it with a muddy quality and purple fringing around the edges. Text displayed from file and folder names in File Explorer, and text in the URL bar of a Web browser looked fine, but anything using small text, such as iTunes dialogue boxes, looked like a messy shade of purple. The small text lost its purple shade when we switched off the Clear Type setting in Windows' Display Properties, but that also made it look more disjointed and much more subdued. This is a minor point considering the system's low overall price of $699 and it shouldn't discourage you from making a purchase. It's not often that you can buy a desktop PC with a Full HD screen in Australia for under $700. Because the screen is glossy, reflections from our office lights were a bit of a problem, even when we turned the brightness up all the way. We recommend that this PC be placed in an area where there won't be too many light sources behind it. 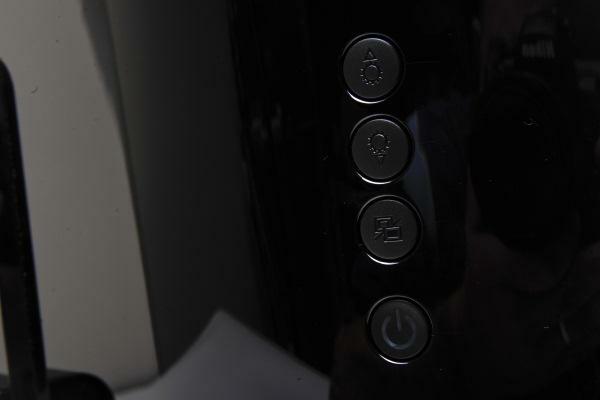 There are monitor controls located on the back of the screen, so you have to memorise that the top two buttons are for brightness, the third button is for switching inputs, and the bottom button is for turning off the PC. The ports at the bottom can be hard to access. You get HDMI in and HDMI out, Gigabit Ethernet, four USB ports (two of which are USB 3.0) and audio jacks. There are dedicated buttons on the back for the brightness, and also for changing screen input. The power button is also located here. The configuration that you get with this all-in-one PC is one that you are stuck with. There is no simple way to upgrade the RAM, CPU or hard drive. No quick access panels, no easy-release latch to pop off the cover. It's a good thing that it contains a relatively potent budget configuration. There is an Intel Core i3-3225 CPU, which is a dual-core, four-thread CPU that runs at 3.3GHz, and it's joined by 4GB of DDR3 SDRAM, Intel HD 4000 graphics (integrated in the CPU), and a 7200rpm, 1TB hard drive (a Toshiba DT01ACA100 model). This configuration offers plenty of speed for typical office tasks, Windows 8 apps, multitasking and more. It also ran fairly quietly during our tests. Because this PC uses a full-voltage desktop CPU, rather than a low-voltage CPU, its speed is better than what we have seen from other recent Windows 8 machines, such as the Acer Aspire U Series all-in-one touchscreen PC. Indeed, in Blender 3D it took only 36sec to complete a four-thread job, and in iTunes it only took 45sec to convert 53min worth of WAV files to 192Kbps MP3s. Both results indicate that this is a strong machine that can be used for a little more than just typical office and Web browsing tasks. This was shown in AutoGordianKnot, for example, where it took 44min to convert a DVD file into an Xvid file, and this means there is plenty of grunt available for tougher tasks such as encoding and editing videos. You can't play many traditional games on this PC though (as indicated by its score of 5195 in 3DMark06), but games downloaded for Windows 8 from the Microsoft Store should play back just fine. We had no problems with Riptide GP, Adera, Agent P and a bunch of other games that we downloaded. More graphically intense games such as Battlefield 3 aren't suited to this system's integrated graphics though. The hard drive put up some decent numbers in our tests. In CrystalDiskMark, it put up a sequential read rate of 189 megabytes per second (MBps) and a write rate of 178MBps, while in our own file duplication tests it put up 64.24MBps. The responsiveness of the system when launching programs and accessing files was quite quick; the large capacity of the drive means you can also store lots of music and video files on the disk locally. External storage can be added via the system's USB ports: there are two USB 2.0 ports on the left side, and two each USB 2.0 and USB 3.0 ports on the bottom. As far as power consumption is concerned, we got a reading of around 47W when the system was idle, 68W when the CPU was under a full load and a peak of 84W when 3D graphics were being processed. The power supply for this PC is external and it is a big fat power brick for which you will need to find a place behind the unit or place on the floor. Other features of the Medion all-in-one PC include a DVD burner and pre-installed Cyberlink PowerDVD software so that you can play your movies — the drive made some uncomfortable sounds while it spun discs during our tests though. There is also a Quicklaunch app installed that brings back some of the functionality of the traditional Windows Start Menu, but it's not exactly like it. You get a built-in webcam, some speakers (these are decent for casual listening), and there is also built-in Wi-Fi (single-band). Medion supplies a set of wireless input peripherals for which you need to plug in a dongle. These should be considered starting points and we'd recommend you invest in some more comfortable peripherals or use any existing ones that you might have. The mouse is flat and glossy, and the keyboard feels more like it belongs on a laptop than a desktop. Its left Shift key is also too small. You should consider the Medion P2010 D (MD 8806) all-in-one PC if you're in the market for a new home computer and you want something that has good speed and a relatively small physical size. It has only a couple of minor flaws, including the fact that it can't be easily fixed or upgraded, but it does represent very good value for money. Medion covers this PC with a 2-year warranty. The Medion MD P2010 D (MD 8806) will be available to buy from Aldi supermarkets on 26 January. If you need help using the new Windows 8 interface on a desktop such as this one, be sure to check out our Beginner's Guide to Windows 8. We show you how to use the Start screen and all of the other features that the new operating system offers.